Barclays bank have just aired what they say will be the first of a series of “public service” adverts which highlight current issues regarding identity theft and fraud. 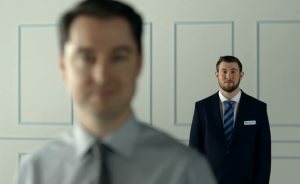 The first advert features a fake Barclays employee attempting to gain account details whilst a real Barclays employee stands in the Background providing a commentary on the fakers “script”. Taken on its own merits the advert does provide worthwhile information which will undoubtedly inform its audience. However the cynic in me cannot overlook the nagging feeling I have that this is a calculated attempt to rebuild their brand thinly disguised as public information.